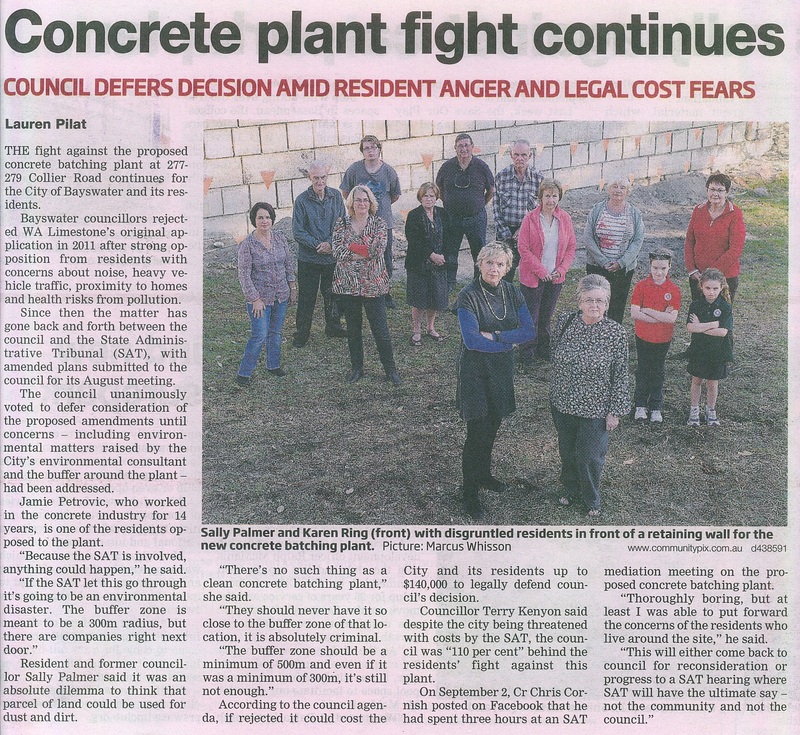 Further to my earlier blog post requesting people to make a submission to the Environmental Protection Authority (EPA), unfortunately the EPA have decided that whilst the proposed concrete batching plant “raises a number of environmental issues … the overall environmental impact … is not so significant as to require an assessment by the EPA”. This is a poor decision in the eyes of the community who will have to live near the proposed noxious industry. There is still hope though. The EPA’s decision is open to appeal, where for $10 and by filling in this form, you can ask the Minister for Environment, Hon Albert Jacob MLA, to direct the EPA to reconsider their decision. The form needs to be submitted by the 4th of April. Bizarrely they only offer a 14-day appeal time-frame and take no account of weekends, public holidays or the fact that their letter took a few days to reach me. In addition to the short time-frame, by not providing an editable version, or sufficient space in the “describe concern” boxes, it would appear they don’t really want any appeals. Daily Production Rate. The EPA state that they gave “particular regard” to “the maximum rate of production of 500 m3/day only occurring one or two days per year”. I suggest that with a plant which will be able to produce 150 m3/hour, the maximum production rate may be three times what the EPA have used as a basis for their decision. Sensitive land use – The EPA should have considered the adjoining business, AbelWestchem, as being sensitive to particular emissions (dust) and hence being a “sensitive land use” as well. The local community have made their views very clear. So let us hope that the Minister acknowledges the valid concerns of the residents and businesses around the proposed site, and instructs the EPA to review their decision of not carrying out an environmental assessment. 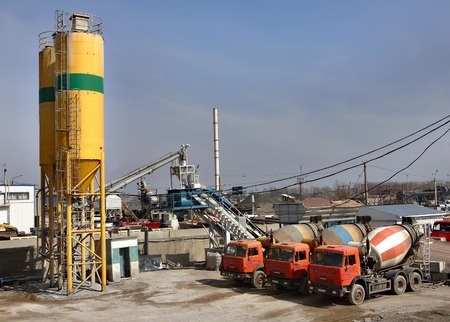 Once a concrete batching plant is established, it’ll likely be there forever. And whilst limitations on the operating hours can be placed on any initial planning approval, as was shown with the East Perth concrete batching plant, things can morph into a 24 hour a day operation. We can not understand the EPA has made ruling that the plant is closer than it should be, but there saying it is alright. They are saying there decisions mean nothing, so why do we have Environmental Protection Authorities, .???? 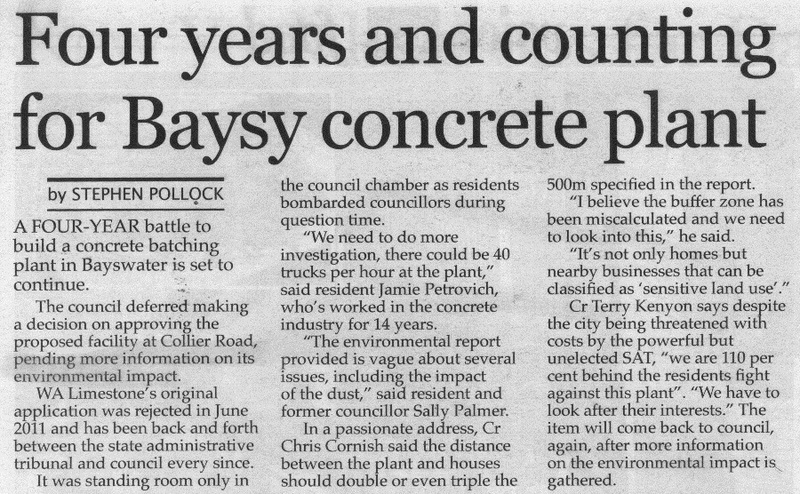 Has anyone seen City of Bayswaters Ammendment 55 which was passed last year. Which deems concrete batching plants a X catagory for planning. Did State Planning approve this ammendment? 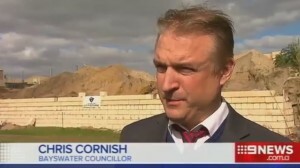 Unfortunately Jason the West Australian Planning Commission (WAPC) informed the City on 20 August 2015 that the Minister for Planning refused to grant final approval for the scheme amendment. There is no right of appeal, so batching plants will continue to be considered a ‘noxious industry’ and a discretionary use in areas zoned ‘General Industry’. This is a great headline, one that shows SAT up for what they really are, un-elected dictators!!!!! a)	The City of Bayswater, as a legislative authority. This is seen as Maladministration and a lack of due diligence by the despotic State Administrative Tribunal and the Attorney General who suppose to be responsible for their performance, that is, to protect those of lesser means not big business.